Basket Weaving - Northern Nights Market Basket - Land O' Lakes Area Artisans, Inc. Learn traditional basket weaving techniques and make the northern Nights market basket! All materials supplied to make this basket, plus use of instructor’s tool for the day. Beginners or experienced weavers welcome! 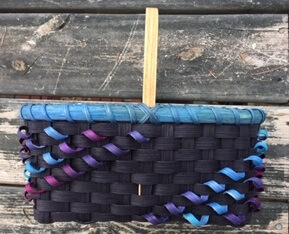 Learn traditional basket weaving techniques to create a small market basket in dyed black reed. Then capture a bit of the grandeur of the aurora by adding cascading curls in space dyed reed. The gradations of color create the borealis – navy, aubergine, wine, teal and aqua. Complete the basket with a coordinating dyed rim and inset ash handle. Leave class with a completed basket ready to stain and enjoy all summer long. Accomplished basket weaver and instructor, Dianne Mockler will coach you every step of the way. Finished basket is approximately 11″ x 7″ x 5″ high excluding the handle. All materials will be included for weaving and use of instructor’s tools. Wear clothes that can get a little damp. Bring a bag lunch and an old towel.